Since the onset of the financial crisis, monetary stimulus has become an increasingly important driver of physical commodity markets including oil, coal and LNG. A sharp move higher in global interest rates over the last month highlights the risks of unconventional monetary policy. Global economic growth is in a fragile state and is ill prepared to deal with the shock of a sustained move higher in interest rates. The importance of central bank monetary policy in driving commodity markets has been a key theme of this blog. Since the onset of the financial crisis, monetary stimulus has become increasingly dominant as the primary risk factor driving global financial markets. This influence has fed through into physical commodity markets including oil, coal and LNG. The importance of monetary stimulus to the global economy was highlighted by the market reaction to the US Federal Reserve’s June 19th announcement on ‘tapering’ its Quantitative Easing (QE) program. The mere hint of the Fed winding back its rate of QE saw a sharp jump in long term interest rates sparking a global asset selloff. In response, the Fed appears to be dampening speculation of any imminent reduction in QE. But the market reaction highlights the risks of massive unconventional monetary intervention. Global economic growth is in a fragile state and is ill prepared to deal with the shock of a sustained move higher in interest rates. QE, the Fed’s purchasing programme of interest bearing assets, has acted to artificially suppress long term interest rates around the world. ‘Tapering’ is the term that has been coined for a reduction in the rate of the Fed’s purchases of US government bonds and mortgage backed securities. The prospect of QE tapering has been debated across financial markets for the last few months and has been responsible for a steady rise in long term interest rates (driven by government bond yields) from historically low levels. However the extent of the Fed tapering announcement came as somewhat of a surprise. The timing and rate of potential reduction in QE (if warranted by economic conditions) was more aggressive than anticipated. The market reaction to this change in policy messaging is illustrated by the jump over the last 2 weeks in US 10 year bond yields in Chart 1. Yields across Europe and much of Asia have shot up in sympathy. 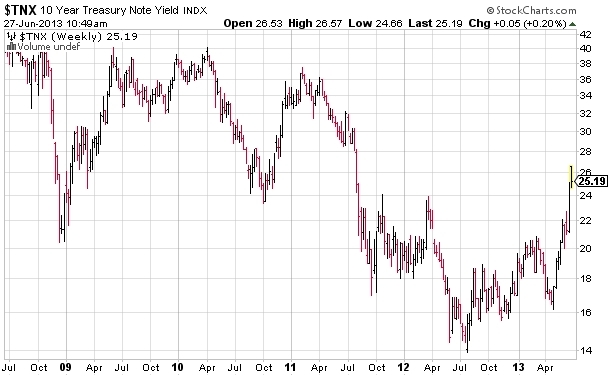 A sustained rise in the yield on long term government bonds has a major impact on the real economy. Not only does it increase government borrowing costs, but corporate and household borrowing costs as well. All loans are priced off a spread to government bond yields. A rise in rates does not necessarily spell trouble if it is driven by an improvement in economic growth prospects. But the unprecedented scale of central bank intervention in bond markets over the last 5 years has increased the risk of interest rate ‘shocks’ where rate rises reflect market reactions to policy risk or sovereign credit risk rather than to expectations of economic growth. The potential damage from rising rates has been compounded by a substantial increase in the sensitivity of governments to a rise in borrowing costs. Sovereign debt has ballooned over the last 5 years as the result of bailouts and fiscal stimulus to fight the financial crisis. The risks around higher interest rates have been highlighted in a recent report ‘Making the most of borrowed time’ presented on Jun 23rd by the General Manager of the Bank of International Settlements (BIS) in Basel (the ‘bank for central banks’). Chart 2 from this report illustrates the rapid growth in global central bank monetary stimulus (left hand side) accompanied by a growth in sovereign debt (right hand side). 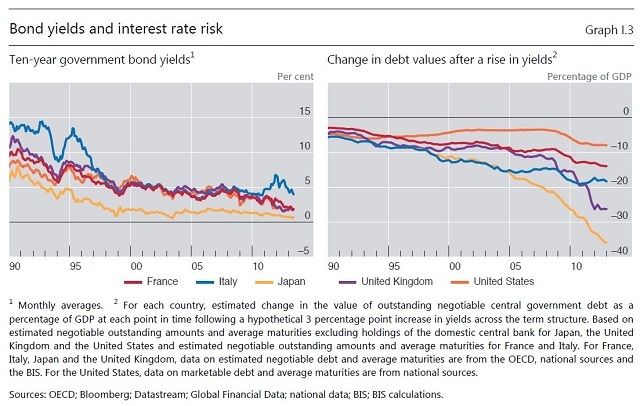 The BIS also highlights the risk of rising interest rates to global financial institutions which hold much of the outstanding government debt. The right hand side of Chart 3 shows the impact of a 3% rise in interest rates on the value of outstanding sovereign debt as a % of GDP for a selection of key G8 countries. A 3% rise is not a big move when measured against historical yields (shown on the left hand side). But the increase in impact of such a rise over the last 5 years is clear, more than doubling for most countries. What central bank accommodation has done during the recovery is to borrow time – time for balance sheet repair, time for fiscal consolidation, and time for reforms to restore productivity growth. But the time has not been well used, as continued low interest rates and unconventional policies have made it easy for the private sector to postpone deleveraging, easy for the government to finance deficits, and easy for the authorities to delay needed reforms in the real economy and in the financial system. After all, cheap money makes it easier to borrow than to save, easier to spend than to tax, easier to remain the same than to change. Six years have passed since the eruption of the global financial crisis, yet robust, self-sustaining, well balanced growth still eludes the global economy. If there were an easy path to that goal, we would have found it by now. Monetary stimulus alone cannot provide the answer because the roots of the problem are not monetary. Hence, central banks must manage a return to their stabilisation role, allowing others to do the hard but essential work of adjustment. Only time will tell whether the Fed and other central banks heed this prescient warning. The Fed’s public deliberations over QE tapering may be a signal of its own concerns over the risks and limitations of ongoing monetary expansion. Regardless, the recent market reaction to the prospect of QE tapering highlights the risk of a move higher in global interest rates. Cheap money may have made it easier for the global economy to absorb the fallout from the financial crisis. But it has left global growth, and in turn commodity markets, particularly vulnerable to a normalisation in borrowing costs. As energy companies manage their portfolio exposures to oil, coal and gas, they are increasingly faced with an implicit exposure to interest rates.